I’ll be honest. I knew going into this week that there wasn’t going to be a whole lot to get content creators excited about CES. Let’s face it, our “Woodstock” doesn’t come until April with NAB. Hhaving said that, there’s been a few noteworthy news items and product announcements that should peak our interest. elGato Key Lights. These LED light panels are designed with streaming in mind. These affordable flat panels contain 80 premium OSRAM ultra bright LEDs in a grid array for an adjustable brightness of 2,500 lumens, with a nice white diffusion for soft illumination. The lights offer an adjustable color temperature range of 2900 to 7000 K, with hues from arctic blue through sunset amber. The lights are 30 x 350 x 250mm, making them ideal for the home studio. In addition, they are Wi-Fi controlled by either software on your desktop, or your smartphone, so that you don’t have to get up and make changes to the dial on the back. It can also work with elGato’s Stream Deck controller, which directly controls brightness, tweak color temperature, and more, at the touch of a button. 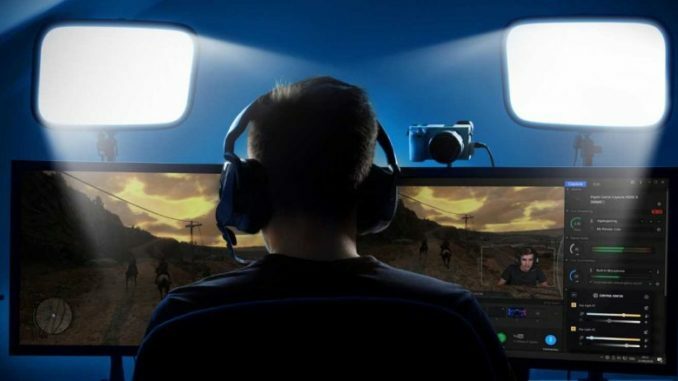 The elGato Key lights come with desk mounted light stands, which enables the content creator to keep his desk up against the wall, rather than move it away to make room for floor based light stands that take up way too much room. So if you are streaming lets play videos, doing talking head video podcasting, or any other kind of live streaming, this setup is ideal. Price? Here’s where it gets interesting. Only $199 each at Amazon. This is definitely going to be in the running for Best in Show, for me. More details can be found here. 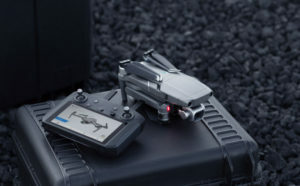 DJI’s Smart Mavic 2 Controller. 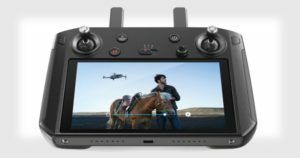 DJI has released a smart controller for the Mavic 2 Pro drone which comes with a 5.5″ touchscreen built in. The Smart Controller offers directly streamed connection in full HD via OcuSync 2.0, and is twice as bright as the mobile tablet or smartphone screens with an output of 1000 cd/m2. That means they can be viewed in direct sunlight. Powered by Android, the controller supports the DJI Go4 app, DJI Pilot, and several third party apps, so the device is far more than just for controlling your drone. You can edit, connect and share your images to the world without having to offload your footage first. Moreover, through SkyTalk, users can live stream to the internet for those special net casts, and a range of up to 8KM (which is a dubious feature considering users have to lawfully keep their drone within eyesight while flying). As for Battery life, even though it has a 5000 maAh battery, the life is not all that great at 2.5 hours, and it looks like you can’t swap out a new battery and keep going. But DJI has a quick charging feature, via QC2.0 USB-C. The downside? Cost is a hefty $650, which may convince users of the iPad Mini to just keep going in that direction, even if they have to deal with making sure an extra device is all charged up. 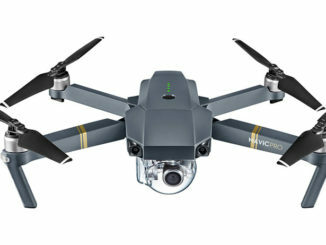 And it only supports the DJI’s “latest drones” and only references the Mavic 2 Zoom and Pro drones. So whether it will control the Phantom 4, Mavic Pro or even the Spark is anyone’s guess. Lenovo Gets Into Gaming with Legion Laptops. Why get all excited about gaming? 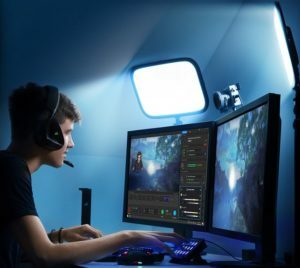 Well, because all too often, the feature set of a gaming computer matches that of an editing rig, and as such, you get the same bang for your buck, especially in a laptop. 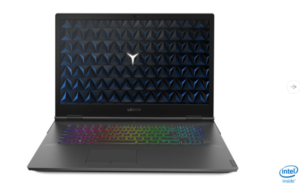 So whether you’re in a battle royale, or on a deadline to deliver your content, this Lenovo Legion Y740 laptop could be a great tool. The Legion Y740 also comes with up to a 6 core/12 thread Coffee lake processor with 32GB of RAM under the hood, and while Lenovo hasn’t aid which model GPU, it is believed to be based on the new Nvidia GeForce 2000 series, or the current GeForce 1050 Ti. As for displays, the Y740 comes in 17-inch and 15-inch configurations with 300 nits of brightness and an HD resolution of 1920×1080. But it’s also bootable to 500 nit HDR through G-Sync. Storage options include up to 512GB SSD running in PCIexpress, and a 2TB spinning hard drive. The Y740 also comes with a four speaker Dolby Atmos system, and 17″ models also get a subwoofer built in. Wow. And for the more colorful, there’s also a Corsair ICUE RGB backlit keyboard, which can be turned off when needed. 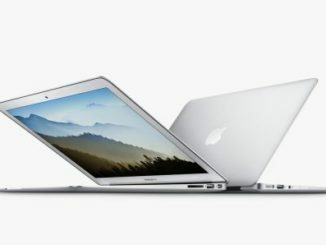 Prices start at $1,749.99 for the 15-inch and $1,979.99 for the 17-inch. Details here. 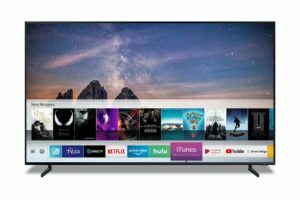 Lastly, I could talk about LG’s super cool rollable 4K TV that emerges from a console, but the really big news was Apple offering iTunes movie and TV streaming through major smartTV manufacturers including Samsung, LG, Sony and Vizio. You can find a complete list of here. The streaming is thanks to Airplay 2 and has made such a huge splash, that one Wall Street analyst has declared that rival Roku is now “uninvestable.” So in spite of a recent report of a 25% gain in market share, that news sent Roku’s stock plummeting by 10%. 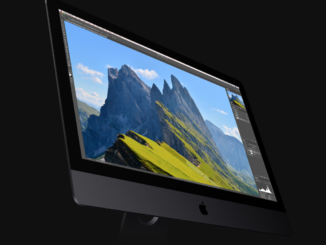 So Apple isn’t even at CES and it’s sticking a dagger into the heart of its competition.